On the ground and in the air, we’re always looking to reduce the amount of natural resources we use—from reusing and recycling materials, to transitioning our conventional diesel and gasoline vehicles to electric equipment and investing in the next generation of sustainable aviation start-ups. We are working closely with the FAA in efforts towards implementing the Next Generation Air Transportation System, or NextGen, by 2020. NextGen will allow us to fly more direct routes and reduce fuel use by optimizing trip durations and improving descent patterns. Our 85 new Airbus A320s with New Engine Option (A320neo), will help reduce carbon emissions more than ever before. All A320neo aircraft improve fuel economy by 15% through newly designed engine technology and cabin changes. JetBlue is the first airline in the world to make the decision to retrofit its in-service fleet with the fuel-saving upgrade of Sharklets. Sharklets are newly designed wing tip devices that are expected to improve the aerodynamics of aircraft and reduce emissions by up to 4%. Since 2009, we have reduced our intensity target GHG emissions by 5%. See how we’re lowering our fleet’s impact. The JFK electric ground support equipment project will improve local air quality by reducing emissions over 13 years. We have set many ambitious goals to manage our global CO₂ emissions, including to transition our wholly-owned ground service equipment to electric power sources where feasible. The move away from conventional diesel and gasoline to electric equipment like belt loaders and bag tugs is a win-win-win. It saves money on fuel costs and maintenance, it reduces emissions and noise while introducing improved safety features. We partnered with the Port Authority of NY & NJ (PANYNJ) to receive an impressive $4 million grant from the FAA’s Voluntary Airport Lower Emissions (VALE) program. The awarded grant funds 60 new electric charging stations, enabling us to convert 116 conventional ground vehicles to electric at JFK. The JFK electric GSE project will improve local air quality via reduction of significant air emissions (25,000 tons of CO, 1,000 tons NOx, and 265 tons SOx) over 13 years. We've set our sights on the West Coast and all our major BlueCities to make the switch in our quest for enhanced operational efficiency. We’ve pledged to support climate action through the American Business Act on Climate Pledge. We’re in business to fly people where they want to go, not to transport trash. Our onboard recycling program helps us reduce operational waste. We’re one of the only airlines with a program in place to sort and recycle the bottles and cans served on all domestic flights. We work hard to ensure our systems are successfully operating both in the air and at every domestic airport. All this effort is making an impact. JetBlue diverts 30 million recycled bottles and cans annually! Recycling in any way, shape or uniform.Our uniform program reduces textile waste. JetBlue and Manhattan Portage.Turning waste into a resource. Millions of people pass through airport terminals each day, and many stop for a meal or snack. We saw an opportunity to reduce our impact by composting food waste at Terminal 5 in JFK. Through our composting partnership with Royal Waste Services, we send thousands of pounds of food waste to a composting facility where it is turned into fertilizer and nutrient-rich soil for farms. After the food waste is processed, much of the compost is transported and used to produce vegetables, fruits, poultry and other organic items. We are regularly collecting 2,000 pounds of material per week. There is more to recycling than just cans and bottles. Other materials need to be diverted from landfills, too—including fabric and electronics (e-waste), which can create air and water pollution. 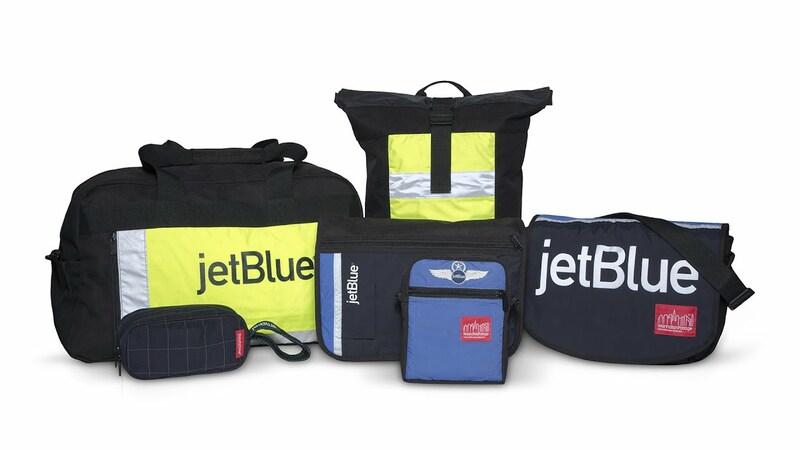 JetBlue has created programs repurpose or donate electronic and clothing instead of letting them go to waste. When we introduced new uniforms for our inflight crewmembers in 2014, we decided to put the old uniforms to good use. 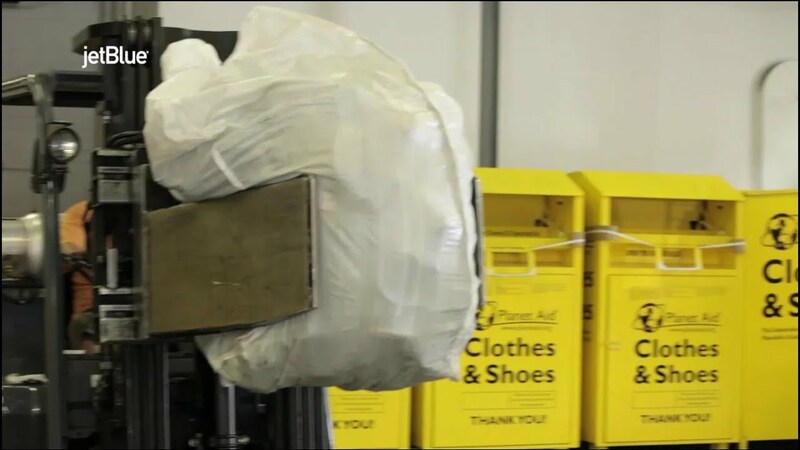 Crewmember brought in 37,000 pounds of old uniform pieces, which we recycled, donated, and sent to communities in need throughout the US, Africa, Asia, and the Caribbean. Some of the fabric was upcycled into bags with the Manhattan Portage. Find more in-depth information about the ways JetBlue is preventing unnecessary waste through recycling. Though most of our energy use is related to jet fuel and planes, we can't ignore the environmental impact of the buildings we operate. How to build a farm at the airport.T5 Farm was built to promote urban agriculture. 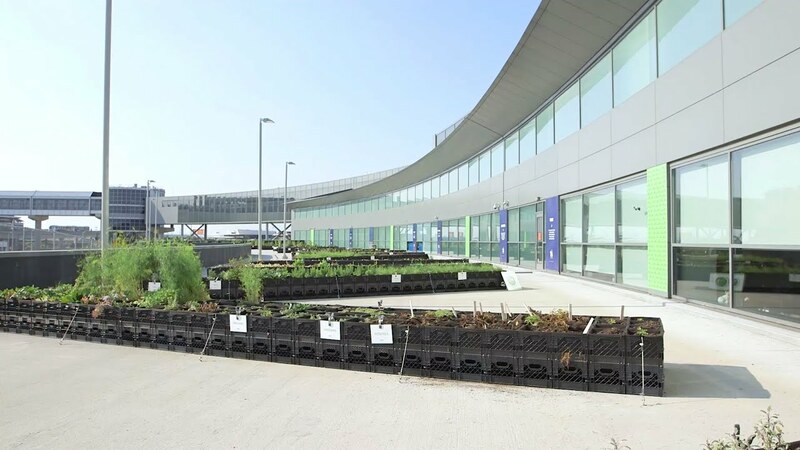 JetBlue is taking farm-to-tray-table to a whole new level with an experiment in urban farming at New York's JFK Airport. On the Departures level of Terminal 5, JetBlue has built the world's first blue potato farm at an airport. The urban farm produces approximately 1,000 lbs. of blue potatoes a season and about 2,000 herb plants, which are grown in recycled milk cartons using organic methods. The organic soil they are grown in partially comes from food waste collected at Terminal 5 which is composted by organic farms in upstate New York in partnership with JetBlue. Crewmembers volunteering at the garden. Recognizing the calming effect of green spaces, JetBlue built the only post-security outdoor space at a New York airport. The area is free for any customer (and pet) to use. Greenspace at the airport.JetBlue’s outdoor space for customers and pets. Strategic use of natural light, including T5's glazed landslide facade, glazing and light monitors, daylight sensors and an open light shaft allow for abundant natural light. The use of fresh-air economizers with air handling units and revolving doors which help save energy and maintain a consistent temperature. The reduction of heat via a light colored roof that reflects solar radiation. Glass increases the flow of light.